"…The nodule was recovered from the region known as 'Merrigan's Field' approximately 50 miles south of Virdan's Folly. It was pulsating with a strange, yellow light. […] We exposed two rabbits and three rats to its radiation for one week. One of the rabbits developed a third eye emerging from its forehead. The other one seemed unaffected, but later gave birth to a litter of tiny, tentacled monstrosities which were so horrible to look upon that several researchers fainted, and we incinerated them in our crematorium. How the rats were affected is unknown - all we discovered was that they had apparently gnawed open the cages one night when no one was observing them. We found minor residues of acid on the bars, which explained how they could escape from the sturdy cages…"
The region where the Eternal Storm is now located used to be one of the most remote outposts of the Atalan Empire. To the wizards of the Empire, this made the region the perfect place to conduct some of their most dangerous magical experiments. This lasted until the year 510 NA, when a network of gates to the various elemental planes became unstable. This somehow created a gate to the Qlippoth, the home planes of the demons, a race of extraplanar beings bent on universal destruction, which in turn collapsed the then-existing elemental planes of air, earth, fire, and water, leaving behind only shattered chunks of elemental matter orbiting the entrance to the Qlippoth. Pure elemental matter broke free into the Material Plane and devastated the land in a radius of dozens of miles. The unstable gates have remained open to this day, sometimes expanding, sometimes contracting, sometimes ejecting, and sometimes drawing matter and creatures into these realms. Thanks to the dangerous nature of the area, civilized settlements are fairly infrequent and far from the heart of the storm - one never knows when the next storm front might break loose. Nevertheless, there are enough brave people here who are willing to gamble with their lives in the search for rare and valuable elemental substances, as well as outlaws and refugees from nearby regions who have nowhere else to go. There are few permanent settlements in this region, and most of these can be found on its outer limits, where storm flares are rare and weak. Closer to the heart of the storm, there are a few nomadic tribes of goblins, and numerous temporary settlements of prospectors. These will operate for a few years and see brisk business, but sooner or later a storm flare will hit and destroy the community. Still, the high demand for the rare ores ensure that a new one will soon appear in its place, for the closer to the Stormheart the prospector operates, the better will be his chances of a rich find. One exception to these are settlements maintained by powerful ritual spellcasters, who use specialized rituals to create protective domes that shield their inhabitants from the elements. These magesinvariably demand high taxes and tariffs from all who live there or come here for business, but they are much safer than any other settlements out there. Most prospectors work alone or in small groups, since the logistics of feeding large groups are challenging (anyone who can magically create food and water can make a fortune by providing for a group of prospectors). Upon arriving in a new area, they usually create a storm shelter first, a small, underground dwelling that (they hope) will protect them from minor storm surges. After this, they will systematically search the surrounding areas for surface deposits of promising ores and substances, and gather them until their provisions run out, whereupon they will return to the nearest outpost of civilization to cash them in, buy new supplies, and spend the rest of their money on beer and other available over-priced amusements. Of course, it doesn't always work out that way. Many prospectors have been caught in the open by a storm flare, killing them - or they reached their shelters, but either the flare was too intense for their shelter to withstand, or it lasted longer than their supplies (including their supply of air, in some cases). Sometimes prospectors dig up more ore than they can carry with them on their trip, intending to return and fetch it some time in the future. And sometimes they are killed by goblin nomads, bandits, or claim-jumpers. As a result, there are many hidden deposits of valuable ores hidden around the region, and many people make a living by plundering these instead of prospecting for new ores. The lands surrounding the Eternal Storm have always been a haven for those with unpopular faiths, as the hostility of the region ensured that they were fairly safe from persecution (if not the elements). And even those who weren't terribly religious before coming here were soon praying to some deity when a storm flare was hitting close. As a result, priests of all kinds are common here, and generally have an easy time of finding a congregation with an open ear. Bucatar, Hatramo, Jorunnos, Palias, and Ungol all speak to the souls of the hardy prospectors who travel the region, and many have uttered prayers to all of them in turn under different circumstances in their lives. Kortus is invoked on by those who see the mineral bounties of the land as yet another "harvest" to be claimed. Finally, fortune tellers who claim devotion to Ygreb are a common sight, and often promise clues to the "next big find". 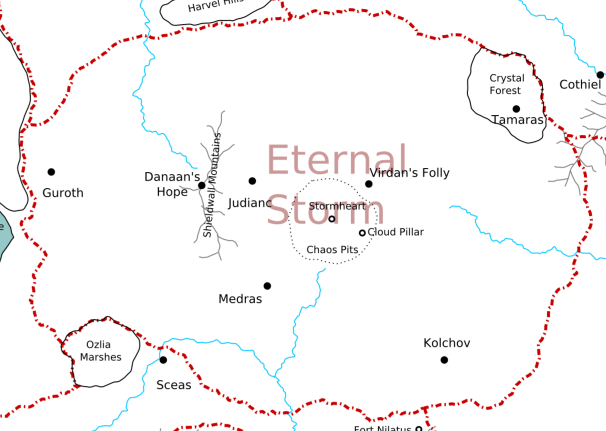 The Eternal Storm started out as a purely elementally-aspected disaster site. But then the "default" cosmology changed with D&D 4E, and I used this opportunity to insert a gateway to hell - or rather, Qlippoth into it all. Which makes for a more interesting locale, though I still need to work out all of the ramifications of this. Beyond the demon connection, this region also works well if you want to run adventures with a "Wild West" atmosphere - complete with frontier towns, grizzled prospectors, dangerous natives, and so forth.